How is Passive Wi-Fi going to change the world? Since time immemorial mankind has strived towards convenience and comfort. Our ability to introduce convenience in everything we do is only outmatched by our ingenuity to make our lives more comfortable through it. And thanks to some student geniuses over at the University of Washington, everyone’s increasingly indispensable digital comfort – the gateway to our digital addiction – i.e. Wi-Fi networks are going to become a whole lot efficient. This in turn will accelerate the practical implementation of a whole new era of digital interconnectedness that we’ve all been waiting for – IoT. As a technological breakthrough, Passive Wi-Fi has some astonishing claims to its name. Claims that will have networking brands beelining at the gates of University of Washington and Jeeva Wireless – a startup that plans to commercialize the technology – eager to get a piece of the impending wireless revolution. But what is Passive Wi-Fi? It’s a research project conducted by two PhD students (Bryce Kellog and Vamsi Talla) in the Electrical Engineering department at University of Washington, a study that conclusively aims to reduce the power draw in wireless communications by several thousand times, a crucial breakthrough to extend Wi-Fi in low-powered sensors and long-term embedding scenarios. Just how power-efficient is Passive Wi-Fi? It claims to be 10,000 times more energy efficient than conventional Wi-Fi, and up to 1,000 times less power consuming than “low powered” Bluetooth and ZigBee networks. How is it different than conventional Wi-Fi? The answer to this question can’t be appreciated fully unless we take a closer look at the radio antenna used in conventional Wi-Fi routers and beacons. These Wi-Fi radios have two critical components – a digital baseband and analog RF, where the baseband is responsible for the digital information sent or received via analog radio waves. The problem arises due to the starkly different power consumption levels of the digital baseband in comparison to the analog RF – where the digital baseband consumes 10 microwatts (μW), the analog RF can consume over 100+ milliwatts (mW) of power. And since the analog RF component in Wi-Fi chipsets is integral for transmitting and receiving data packets, you have to stick with it. Without it, your phone, router, smartwatch, laptop, etc., simply cannot communicate with each other. In short, analog RF seems to be indispensable for wireless communication to take place. But that’s the point – it’s not indispensable. That’s the whole premise on which Passive Wi-Fi is based on, as it tries to re-imagine wireless radio communications without a critical analog component in it. That’s the gamechanger, right there! What Passive Wi-Fi proposes to do is to have the analog RF component present along with the digital baseband in just a single plugged-in device – like a wireless router or laptop – in any wireless network. Power draw here isn’t an issue because the device is plugged into a power source, obviously. For all other non-plugged in, battery operated wireless clients connecting to the wireless network – things smartphones, smartwatches, iPod, etc. – you can have Passive Wi-Fi chips that don’t have the analog RF component in them. 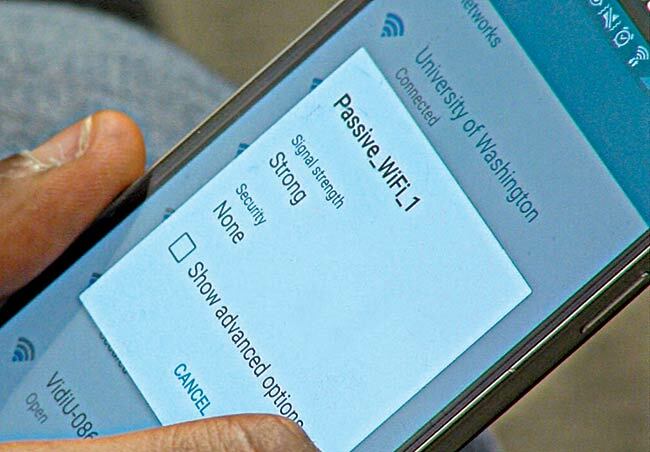 Experimental evaluation of Passive Wi-Fi so far claim that “transmissions can be decoded on off-the-shelf smartphones and Wi-Fi chipsets over distances of 30-100 feet in various line-of-sight and through-the-wall scenarios,” according to the University of Washington’s website. The researchers also designed a Passive Wi-Fi IC to evaluate power draw of these wireless data signals. They found that roughly 1 and 11 Mbps transmissions consumed 14.48 and 49.28 µW of power, respectively. This is big news, because transmitting radio waves at such ridiculously low power consumption levels is tough. 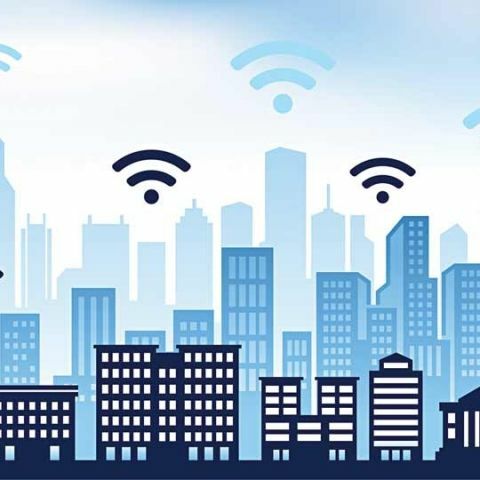 Technically, the principle that Passive Wi-Fi uses to create a Wi-Fi network across several devices at such low power consumption levels is called backscattering, which is different from a more traditional mesh network (deployed in ZigBee, Bluetooth LE, etc). In backscattering, nodes blindly transmit data whenever they sense it – Passive Wi-Fi just implements backscattering at never-before-seen levels of power efficiency. While Passive Wi-Fi is exciting and promises to revolutionize wireless communications technology, we mustn’t get too ahead of ourselves just yet. Remember, for most parts, whatever we’ve seen of Passive Wi-Fi still remains a tightly controlled research experiment. There are several hurdles to cross, both with respect to implementation speed and commercial availability. Right now, Passive Wi-Fi isn’t really a viable alternative to conventional Wi-Fi simply because of its operating bandwidth – right now, Passive Wi-Fi can only support speeds of up to 11 Mbps, which is roughly the same as Wi-Fi 802.11b speeds – what was fashionable way back in the mid-2000s. The Passive Wi-Fi protocol would need to be severely refined if it has to be accepted in our homes any time soon, because forget about streaming YouTube videos or gaming on those speeds. Also, Passive Wi-Fi chips will need to get into all the devices that we hold dear for us to truly make use of the benefits it bestows. That’s what Jeeva Wireless is tasked with, a startup founded by the lead researchers of Passive Wi-Fi to ensure Broadcom, Texas Instruments, Atheros, Qualcomm, and other big semiconductor manufacturers, adopt the technology at the earliest, as they manufacture and control the ICs and chips that go into our routers, laptops, smartphones, and other devices. The researchers have suggested that the tiny Passive Wi-Fi devices are extremely cheap to make, costing less than a US dollar, for instance. At mass production, the scale of volume will no doubt drive down the cost even more significantly. What cannot be doubted, though, is Passive Wi-Fi’s potential to breathe a whole new life into IoT (Internet of Things), allowing battery-operated, deeply embedded sensors to transform into Wi-Fi beacons. Imagine your running shoes, coffee maker, car, highway toll booth, security camera and countless other devices start getting connected simply because the power problem doesn’t matter anymore. Passive Wi-Fi holds the power to turn the dream of smart home into a reality sooner than we would’ve thought.